The Los Angeles Lakers have stumbled to a 3-5 record and are struggling with several issues such as closing out games, chemistry, shooting, and an inefficient defense. But perhaps the biggest problem for the Lakers has been their lack of depth at the number five spot. JaVale McGee has had an excellent start this season (he’s averaging 15.5 points, 7.5 rebounds, and 3.3 blocks) as he’s thriving in a bigger offensive and defensive role when compared to his two previous seasons with the Golden State Warriors. The problem is that although he’s putting considerably better numbers, he’s also playing a lot more, and the team lacks additional quality centers to spell him when he needs a breather. In Golden State McGee was averaging 9.55 minutes per game, while with the Lakers he’s averaging over 26 minutes making it obvious that they need to add more talent at the position if they want McGee to continue playing at this level the entire season. The issue stems from the fact that Ivica Zubac has been terrible, and Moritz Wagner has been dealing with a nagging knee injury since the start of the season. 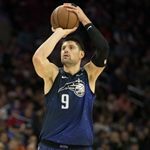 Nikola Vucevic (Orlando Magic): The Serbian has been solid this season as he’s averaging 18.6 points, 10.9 rebounds, 4.3 assists, one block and 1.4 steals per game. This 28-year-old problem is that he no longer seems to fit in Orlando’s as the team’s looking to give more minutes to rookie Mo Bamba, who’ s already showing flashes of greatness In Los Angeles Vucevic would be capable of playing extended minutes as he either starts or comes off the bench to provide instant offense and bolster their defense. Pros: He’s probably the best player the Lakers could trade for. Ed Davis (Brooklyn Nets): He’s a tremendous rim protector and one of the best backup big men in the NBA. He’s also a former Laker as he already was with the team in the 2014-15 season. He’s a very solid defender and an amazing finisher in the pick-0and-roll. He would provide the Lakers great rebounding, excellent finishing at the rim and great protection inside the paint. Pros: Davis and McGee would give the Lakers a very solid rotation at the center position. Cons: He struggles to make his free throws in clutch situations and the Nets will probably demand more than what the Lakers are willing to offer for him. Tyson Chandler (Phoenix Suns): Although this 36-year-old is no longer the elite defender he was in 2011 with the New York Knicks, he’s still a decent rim protector and a very solid rebounder. Although he carries a higher injury risk than the other players in this list, Chandler is probably better than any of the current backup centers the Lakers currently have. Pros: He would be a cheap option that would not cost much. Cons: He’s not the best option due to his age and the overall decline of his skills.